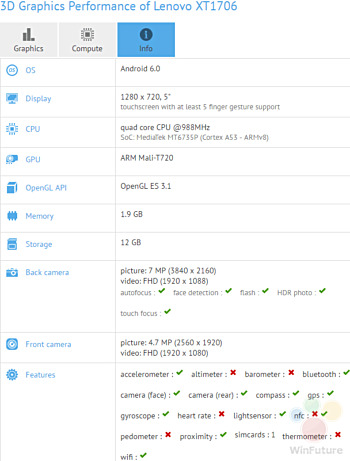 A couple of new Lenovo-branded smartphones have been spotted on GFXBench, and curiously, both have same specs. They are powered by MediaTek MT6735P SoC and sport a 5-inch HD display. RAM is 2GB, while internal memory is 16GB. The camera department is handled by an 8MP rear unit and a 5MP front shooter. Both come with Android 6.0 Marshmallow pre-installed. While nothing else is currently known about the devices, their model numbers - XT1700 and XT1706 - does indicate (XT followed by four numbers) that they are actually Motorola handsets, with reports suggesting we could be looking at next-gen Motorola Moto E, or a Lenovo Moto E may be?. This phones specs are same as lenovo p1m.And by same I mean everything same.Lenovo p1m works really good.you can see review of it.so I'm expecting bit better performance from Motorola considering marshmallow and stock android.